The quest for international food hunt continues. Granted, I have already went to a Peruvian restaurant to make it for the “P” entry, but since I have not yet tried Polish food in this city, well, there is no good reason to not go. Besides, it’s food. And this place serves barszcz, and I was hankering for some delicious beetroot-based goodness. 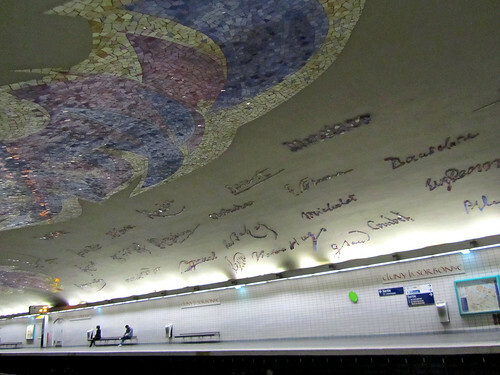 Off to Cracovia on rue Moufftard so. 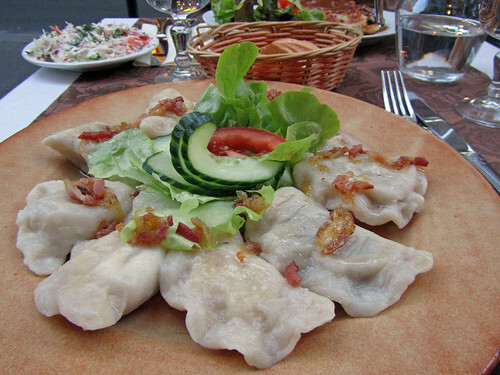 Pierogi, considered Polish national dish, are essentially dumplings. As Cracovia serves pierogi with a number of different types of filing, and I had difficulty choosing one over the others, I went for the easy option – pierogi mixtes. I was given pierogi with groud meat, cabbage and mushroom, and white cheese and potatoes. Of the three, the dumplings containing ground meat were the ones I liked best. You should try it sometimes if you could. Just ask for pierogi z miesem. 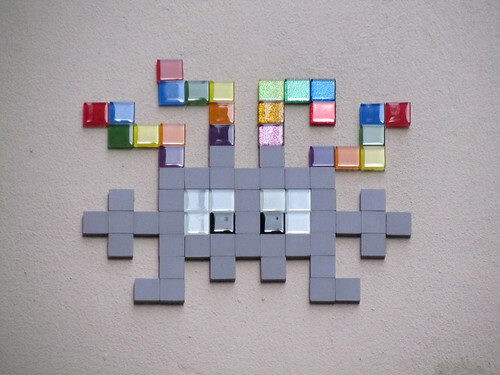 Pixel art is fun, pixel art in bedazzled tiles is even more entertaining. As a child, growing up, my first memories of computer/video games are of Mario Bros (ah the days of game cartridges and square Nintendo box), Space Invaders (black 8″ floppy disks! ), Pacmac and Pinballs (giant machines at the arcade, anyone?) but somehow I seem to have outgrown them quicker than I’d anticipated. Nowadays it’s all nostalgia and reminiscing the past, and me unable to play wii without embarassing myself. 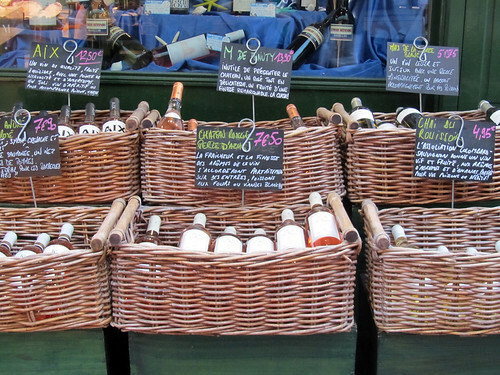 Day 241: Red, white or rosé? Whenever I get invited over to a friend’s for dinner, I’m very likely to show up just after specified time (5-10 minutes leeway – I’m learning that it is polite around here not to show up on the dot), with a wee gift in the form of either cake, chocolate, or wine. 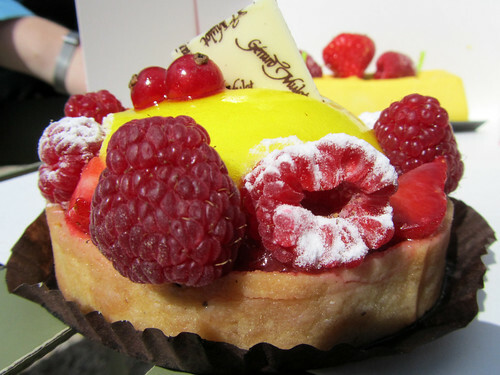 Finding and sharing cakes or chocolates are more my forté; wine, not so much. I’d rely on recommendations, either from friends or vendors. Otherwise, it’s going to be a hit or miss. 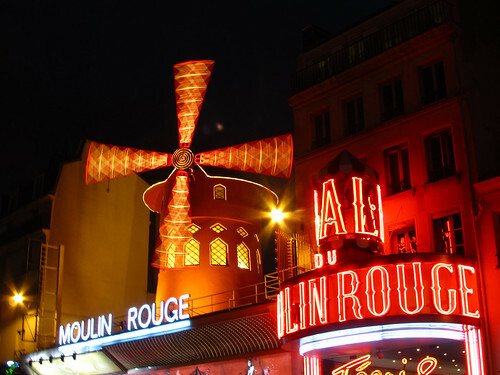 When one talks about Montmartre, one talks of the artists that use to populate the quarter and the , one talks of the Sacré-Cœur, one talks of the movie Amélie, one talks of the Moulin Rouge. 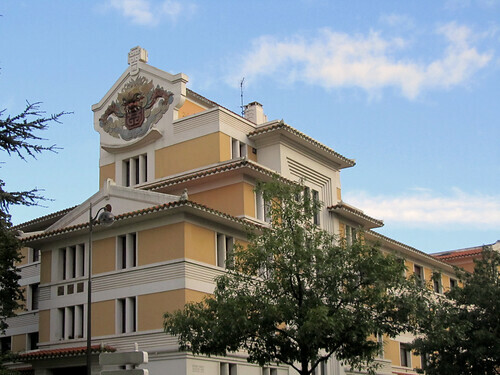 Curiously, not many people talks about the one museum in the area that opens daily till 2am. Surely there must be enough people that visit the place to keep it going for so many years (14!). It seems the post-it war has arrived at my friend’s workplace so I get my opportunity to grab a shots or two of this summer project afterall! I spotted Pikachu, Pac-man, Space Invader and the likes. They seem to be the most popular motives, aren’t they? 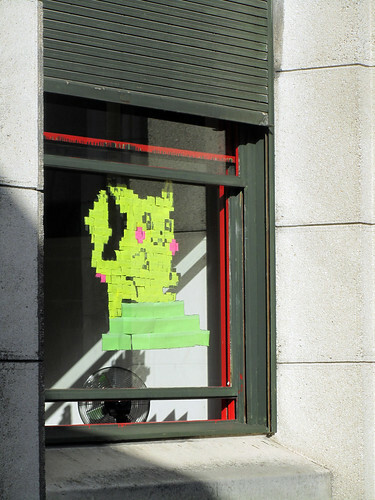 And, if you want to play post-it war yourself, there’s even a tool for it – yup, a website that generates post-it images for you, tells you how many post-it you’ll need and the time required to build your post-it figure. Have fun! I have previously introduced Sainte Geneviève, the patron saint of Paris. Today, we shall talk about Saint Denis, a martyr who was Bishop of Paris a long long time ago and the patron saint of France (how’s that for a trump card?). And to make sense of the story of this headless saint, we should also talk about Montmartre. Saint Denis was said to have been beheaded at Montmartre (giving rise to this name that means “mountain of the martyr” – but on all accounts, there are 2 other possibilities on how Montmartre came to be known as what it is called today) but a devout bishop that he was, it didn’t stop him from continuing to perform his duty to the God. He picked his head up and started walking to the north, all the while preaching a sermon as it should (I figure that must be one of the miracles to propel forth his beatification) until he came to a spot where he decided it would be his final resting place. A cathedral/basilica bearing his name stands today at that spot, and he has plenty of royal companies in burial, as all but three French kings have their final resting places here. 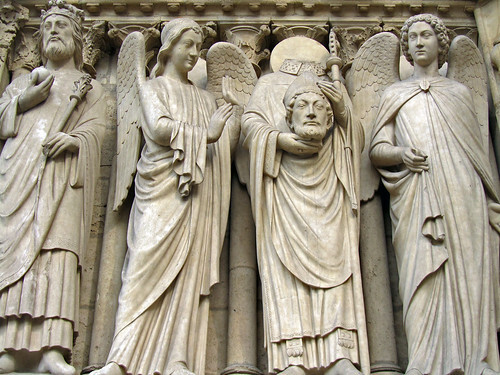 I still haven’t visited the cathedral, and if you’re wondering where I find the statue above, well, it’s from the left portal of the west end of Notre Dame Cathedral. Monday night would normally not be my choice for an evening out but given there was a birthday to celebrate, I quite happily agreed to go out for a quick drink and then dinner afterwards. Our meeting point for the evening was at L’Atelier, a bar on boulevard Montparnasse, situated right across the street from La Coupole – one of the famous cafés that famous artists and writers of 1920s flocked to. L’Atelier was relatively quiet when we got there and we sat out in the terrace, enjoying the last of the weekend heatwave while observing the storm cloud gathering in. 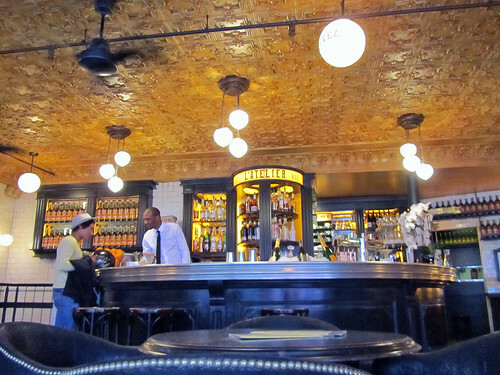 Unlike many bars in town, its Happy Hour didn’t start until 7pm. Not that it made much difference to me (since I’m not a tippling kind of girl) and it seemed, the general crowd too, as it never really got busy when we were there. Then again, it was Monday afterall. Weekend may tell a different story around here altogether.